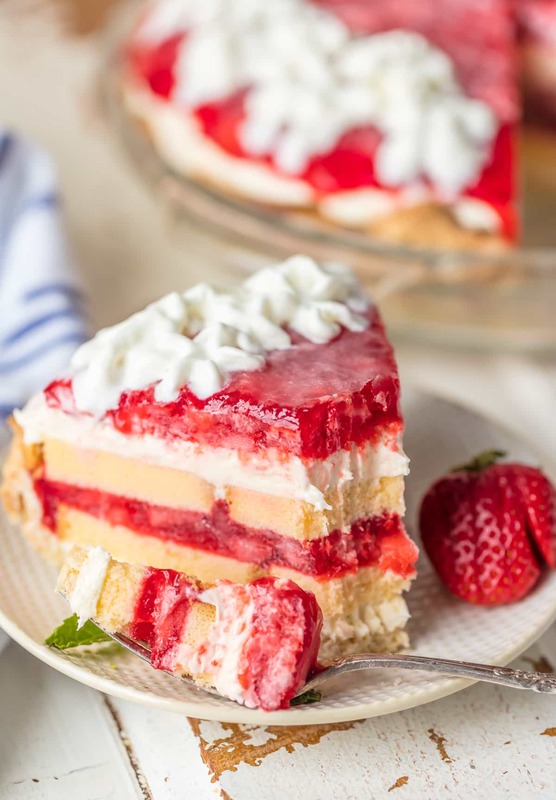 STRAWBERRY SHORTCAKE PIE is the ultimate Summer sweet treat! 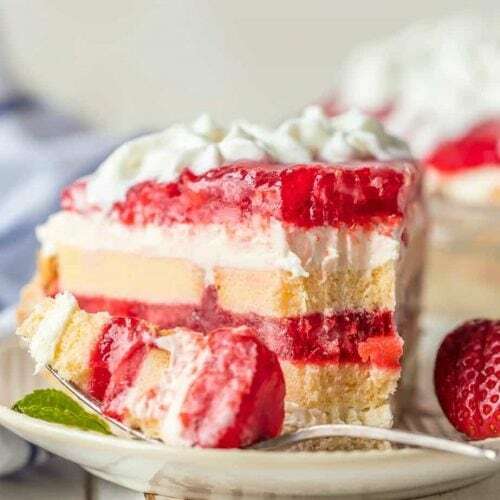 This easy strawberry shortcake recipe has layers of strawberries, cream, and pound cake, and it’s absolutely delicious! The classic flavor of strawberry shortcake in the form of a tasty strawberry pie. Strawberry Shortcake Pie is the perfect summer dessert. 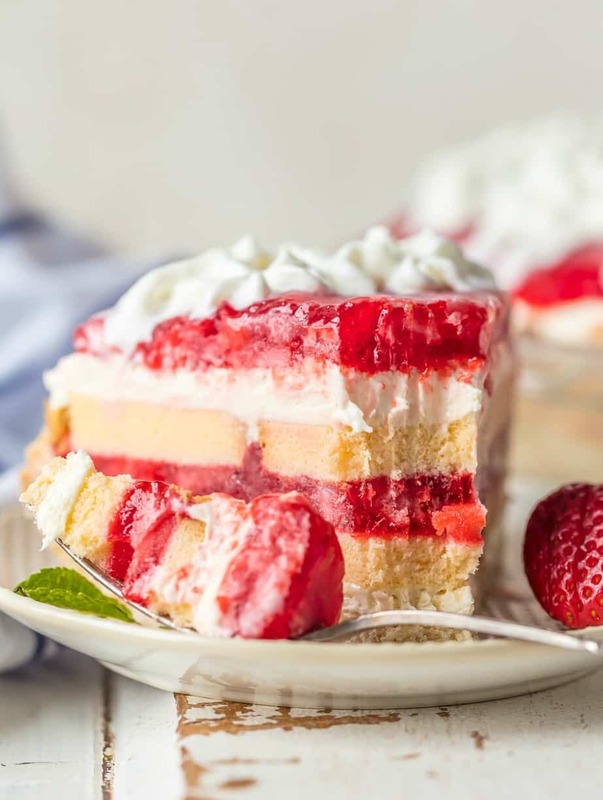 This easy strawberry shortcake recipe is layers of absolute deliciousness! SUMMER IS HERE! Long days, cold drinks, time with friends, and strawberry desserts! My Mom has been making this Strawberry Shortcake Pie for years and I finally got the recipe so that I can share it with all of you! She came over and made it for me, and I loved it today as much as I always have. This easy strawberry shortcake recipe is one of my all-time favorite desserts and I just know your family will be as obsessed as we are. 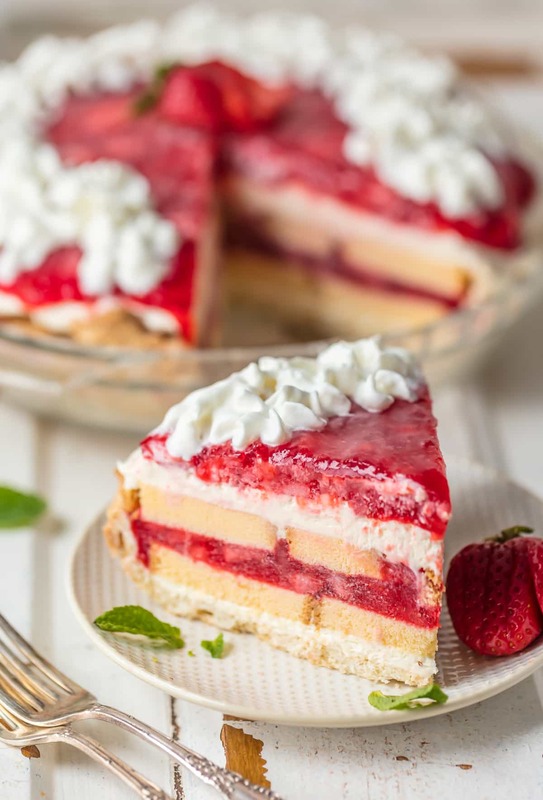 I love the cold layers of strawberry, pound cake, and cream…all in a pie crust and topped with whipped cream. Beyond delicious! Learn how to make strawberry shortcake in pie form for the perfect easy dessert recipe for summer! 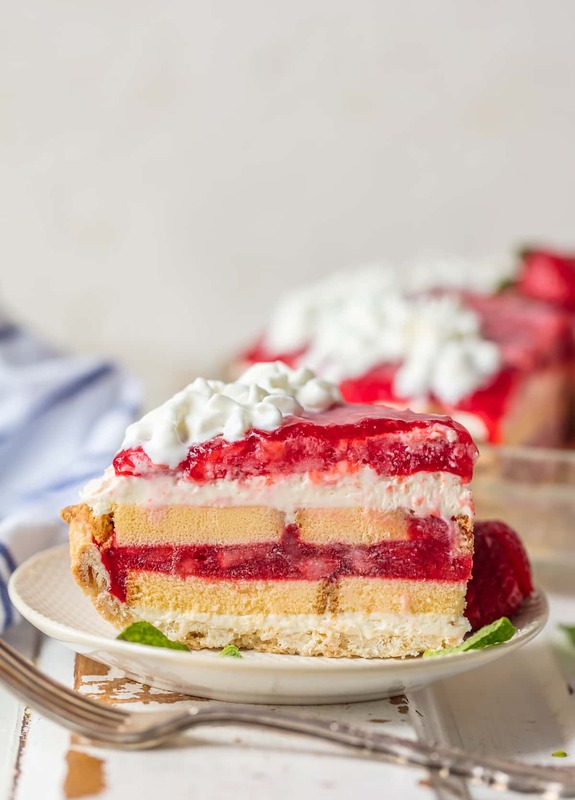 This easy Strawberry Shortcake Pie is layered so perfectly with cream, strawberries, and pound cake! 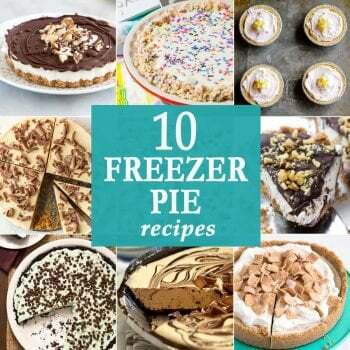 I can never have enough easy dessert recipes, especially for summer, when I’d rather spend my time outside EATING the dessert, rather than inside cooking it. 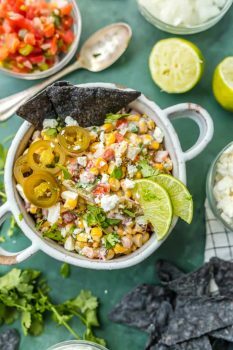 This is the perfect thing to serve out on the patio in the evening with family or friends. 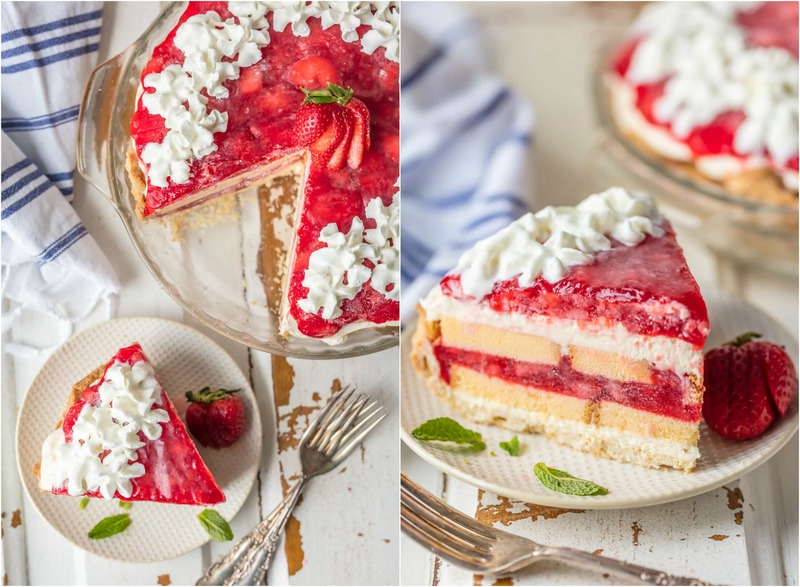 If there was ever summer in a pie dish, this Strawberry Shortcake Pie is it! You’ll want to make it for BBQs, potlucks, get together, birthdays, you name it. It can be made year round, but I feel it’s just perfect for June-August. It screams Summer, don’t you think? If you’re ready to be the hit of the party, bring this easy strawberry shortcake pie! This easy strawberry shortcake recipe is so delicious, and so fun to make too! It’s absolutely filled to the brim with amazing ingredients, and I love assembling the layers to create the perfect pie. You will make the cream cheese filling to layer into the pie, but there’s no baking involved. It’s mostly just a matter of layering up all of the ingredients! Pie Crust – you can make your own if you prefer, but a store-bought pie crust works just fine (and makes this recipe much easier). Cream Cheese Mixture – Beat cream cheese until light & smooth, and mix with powdered sugar, white chocolate, and almond & vanilla extract. Pound Cake – Again, you can make your own, but I like Sara Lee’s pound cake, and store-bought makes this recipe quick and easy. Cut the cake into 1/4 in slices and place in a single layer on top of the cream cheese. Cut smaller pieces of cake to fill in gaps and make an even layer. Strawberry Mixture – Mix fresh sliced strawberries with the strawberry glaze to get that fresh made texture. Apply a layer of this on top of the cake layer. Another layer of the pound cake. Another layer of the cream cheese filling. Another layer of the strawberry glaze on top. Add some cool whip, drizzled white chocolate, and sliced strawberries on top for decoration (optional). This creates the most beautiful strawberry shortcake pie! I love how easy it is to just buy the ingredients and make the pie, layer by layer, without any extra hassle. Like I said, you can always make some of these ingredients homemade (pound cake, strawberry glaze, pie crust), but that wouldn’t be quite as easy! I love to keep a slice of this easy Strawberry Shortcake Pie in my freezer and pull it out for a late night snack. Can you blame me? It’s just utterly delicious. The flavor combo is to die for. I know you’ll agree once you taste this easy summer dessert! Watch the Video & See the recipe card for details on how to make Strawberry Shortcake Pie. Enjoy! 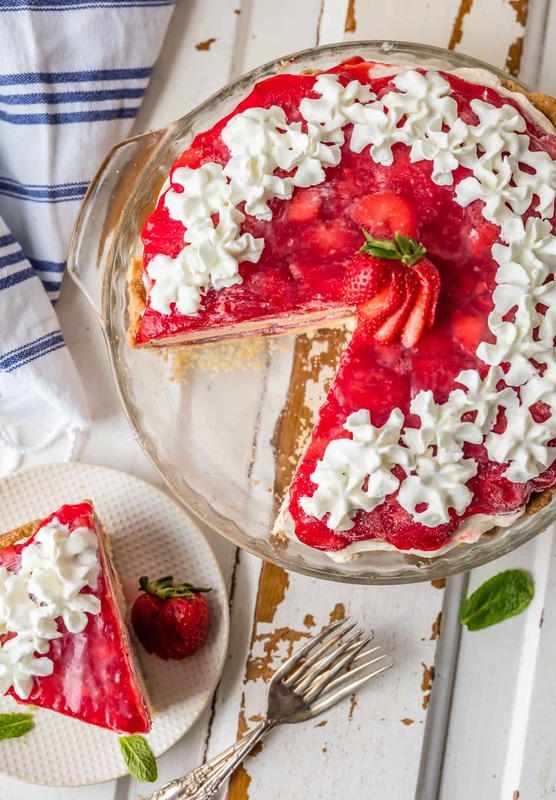 This STRAWBERRY SHORTCAKE PIE is the ultimate Summer sweet treat! Layers of strawberries, cream, and pound cake make for an easy strawberry shortcake recipe that is sure to please. Place cream cheese in a mixing bowl. Beat on HIGH until light and smooth. Add powdered sugar, melted white chocolate, almond extract and vanilla extract. Beat until well combined. Fold in 1 cup whipped topping. Set aside. Set aside 4 strawberries to slice and use as decoration/garnish. Mix together the remaining sliced strawberries and strawberry glaze. Set aside. Spread ½ cream cheese filling over the prepared pie crust. Place cake slices over the cream cheese filling-cut the cake slices to cover the holes where needed. Spread ½ strawberry mixture over the cream cheese filling. 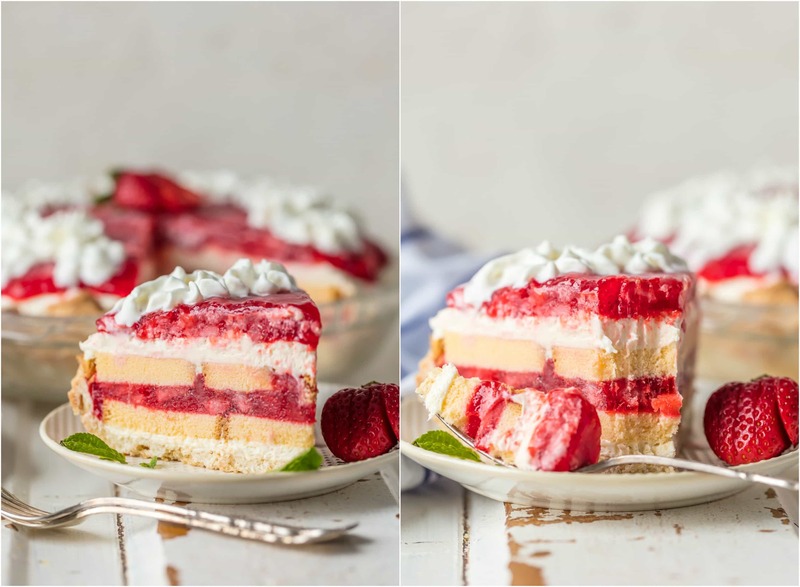 Place cake slices over strawberry mixture. Spread ½ cream cheese filling over the cake layer. Spread ½ strawberry mixture over cream cheese filling. Decorate the strawberry top layer with dollops of Cool Whip, drizzle with melted chocolate or white chocolate, strawberries and mint leaves. A nice recipe, it seems so soft and tasty. Thanks for your article, it’s very helpful.